Thanks to Jeanie Lowe for the pictures included above. 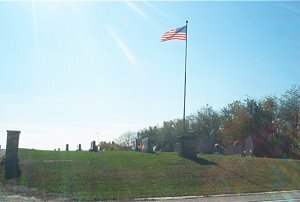 I completed the reading on this cemetery during the weekend of October 5 & 6, 2002. After transcribing the reading, I merged the burials which had been taken from death certificates (for which no stones were found) into the reading. 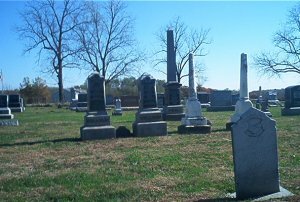 I've also added a number of burials (again no stones were found) which were taken from obituaries. Every effort was made to complete the reading and transcription accurately, but with any human endeavor - there may well be errors. I also feel, given the many empty lots in the cemetery, that there are a number of other unmarked burials here. If you find errors, or know of additions which should be made, please let me know. 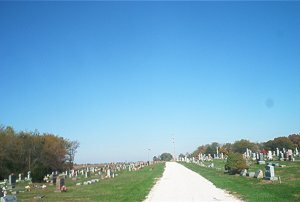 This cemetery is well maintained and is adjacent to U.S. Rte67/Rte 104 on the south side of the highway, two miles east of Chapin and about 1/2 mile west of Mauvaisterre Creek. 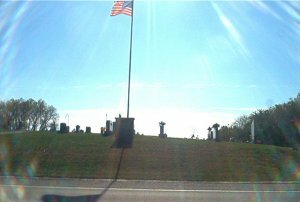 The cemetery sits on a hill, right after rounding a curve in the highway - there are signs which indicate a "hidden entrance" and "cemetery entrance" along the highway, but you need to be very alert to make the turn safely into the cemetery. 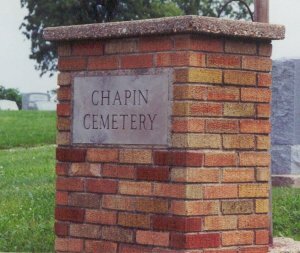 During the 1930s or the 1940s the cemetery gradually came to be known as "Chapin Cemetery" and the sign at the entrance saying "Jordan Cemetery" was removed. Jordan Church was located here prior to its removal. 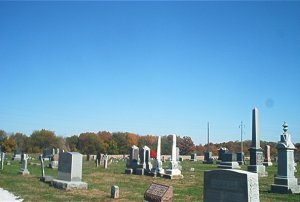 If a Name appears in red, click on the Name to bring up a photo of that individual's tombstone.